It seems so simple – have enough staff who are well versed in your products and services available at all times. But, the reality is not as simple. Staffing has been diminished compared to years past for economic reasons, and staff turnover, especially at big box type retailers, can be common. How can you ensure that customers are getting what they need, especially those that come in uncertain about what to purchase? 1. Maintain adequate staffing: reducing staff in order to keep costs down seems efficient. The mantra “do more with less” has become commonplace in the last several years, but this practice could end up costing the business in sales. 2. Provide adequate training: this is not only training within their department or area of work, but also provide some behavioral training so that employees are in tune with what an indecisive shopper might look like. They may not always actively seek help; knowing what signs to look for as customers browse can help employees be proactive in offering help, further enhancing this customer’s experience. 3. When you’re short on staff, go with the next best thing: Interactive consumer engagement tablets are starting to emerge in many retailers and restaurants. These tables can be placed in high traffic areas to provide information, product selection help, and other valuable information. While it doesn’t always replace an associate, it’s a cost effective option that will allow customers a self-serve option that can be very effective in helping indecisive customers. A sufficient number of available, knowledgeable staff is key to keeping customers satisfied – finding ways to make sure this is readily available across your locations will go a long way in maintaining a strong customer experience. What Makes A Customer Leave Without A Purchase? If you’ve ever wondered why customers leave without making a purchase, you may want to consider a recent study conducted by TimeTrade. Over 1,000 consumers were surveyed about their shopping experiences, and similarities were found regarding the reasons why customers do not make a purchase. The answer seems simple based on this research – being able to find an associate to help, and that associate having the knowledge to assist customers in making a purchasing decision. 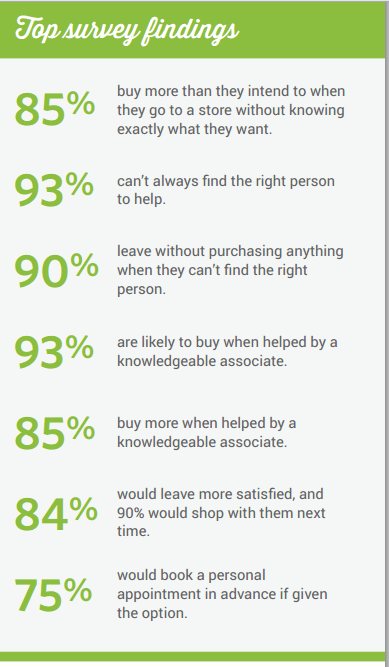 Approximately half of the respondents indicated that this was vital when they are not certain of their purchase before reaching the store, and 93% reported that they have not always been able to find an associate to help them when they are shopping. Of those who could not find an associate to help them, 90% reported they would take their business elsewhere. Ann Michaels & Associates | Comments Off on What Makes A Customer Leave Without A Purchase? Customer feedback is used for many perspectives, from frequent customers to new customers. One item that is often asked on a feedback survey is some version of “What is one thing we can do to improve future visits?” While a good question, one that might spark a new product or service idea, often times customers don’t have specific suggestions. In other words, they don’t know what they don’t know. Our marketing experts use an intensive research and analysis process to understand who our potential customers are, what they value and what they want in a vehicle. We define a “brand DNA” and a “target customer” for each of our main brands and products. The brand DNA and target customer profiles go beyond simple demographic information such as age, gender and income; we build complete profiles of our target customer, including information such as what they like to do, what music they listen to and where they shop. Using a fully developed, typical customer as the focus for vehicle development brings our market research data to life and keeps everyone on the product development team focused on designing a vehicle that meets customers’ needs and desires. At the Industrial Designers Society of American (IDSA) Conference earlier this summer, Ford engaged in a panel discussion surrounding this very concept of using customer insights for future car designs. Specifically, they obtain feedback from target customers prior to the design process, and then again as the initial design process has completed. They will go as far as talking directly with customers, allowing them to provide detailed feedback on what they like and don’t like. The company finds that this will yield a strong product for its customers. This is a great way to use customer perception and feedback for new products; more and more, customers are very in tune with what they like and don’t like. While Ford conducts this feedback research on a very high level, it is something to consider on a much smaller level. 1. Ask the right questions: customers may see a general question like “what is one thing we can do better next time” as a more literal question, and only thing about their experience from a limited standpoint. When this happens, you may see responses such as “open more registers during busy times” or “have more staff on the sales floor to help customers.” These are limited, more operational type observations that help companies see where they can improve, but don’t lead to future forward thinking. Instead, ask if customers frequent your business often; if they are regular customers, ask if they would be interested in participating in a feedback program specific to new products and services, or serve on an online feedback panel. This way you can target those customers to get their feedback, while making them feel like they are a part of your business, and that you value their business. 2. Don’t just focus on the existing customers: new customers often have a lot of suggestions too; after all, their first experience with your company gives a fresh perspective. What made them visit? Did they find what they were looking for? Did their pre-visit perception match what they experienced in store? What can you do differently to keep them as a returning customer? This insight is valuable and can provide insight into other products or services you can implement into your company. 3. Ensure you have a consumer panel for a new product launch: soft launch or pilot programs ensure that things run smoothly. While you’re testing at the company level, the next step should involve a small base of customers. Let them use the system or new product, test it out, and give their feedback before it goes to market. Since they are on the front lines, and seeing it for the first time, they can provide some good insight into any issues, bugs, or ways to improve before it is officially rolled out. If you have a panel in place, as suggested earlier, this will be easier to do. 4. Use social media data: expand your horizons a bit by using a social media monitoring program. This type of program can scour the internet for conversations as general as “automobile designs” or “clothing for teens.” Use these real-time conversations to learn what consumers are thinking, what they need in your industry, and where the industry falls short in the eyes of consumers. Using customer feedback can be extremely useful in making sure your new products and services are the best they can be. As consumers become more savvy and educated, thanks to the world of social media, take advantage of their opinions, feedback, and suggestions for improvement.